From the Golden Globes to new stuff on Netflix, here's what you should watch out for this week. Before you settle down to eat your leftover Christmas chocolate and start flicking through the channels to see what's on actual TV, stop. Us lot here at GamesRadar+ have got eight things that should be on your, ahem, radar this week. From the Golden Globes to new stuff on Netflix, here's what you should watch out for this week. 1. Star Trek Discovery resumes its incredible first season… and we want answers! What is AGDQ and why should you be watching it? 8. Can the expanded, “more relaxed” X-Files: Season 11 give Scully the send-off she deserves? Picking straight up where season 10 left off, this next run of The X-Files is going to get a rather different treatment. And a much better one, by the sounds of it. Where the previous revival season had to pack in seven years of recap, a splash of ongoing mythology, a bunch of new stories, and has only six episodes to do all of that in, season 11 has no such worries. It can dive straight in – and it’s going to, the first episode immediately cracking on with Mulder and Scully’s search for their long-lost son, William – and it then has the breathing space to run. The first and last episodes will focus on the series’ bigger mythology, while the other eight – reassuringly – will be standalone, monster-of-the-week affairs. 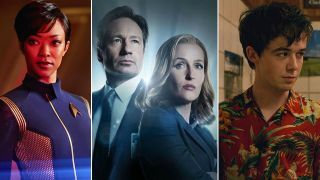 And, in the tradition of The Best X-Files, Glen Morgan and James Wong – the script team behind season four’s brutal Home -have written an apparently very arresting episode, while Darin Morgan has scripted what sounds like another, stand-out comedy episode.